Nordhavn is a distributor for Twin Disc in Denmark, Greenland and the Faroes. This makes us the sole supplier of Twin Disc maritime transmissions and electronic control systems for diesel engines and transmissions for the maritime market. Twin Disc was established in 1918 and is a market leader. Twin Disc is known for providing solid and reliable products, which are popular in vessels for professional use as well as pleasure. MG is the traditional and well-known reverse transmission with a power performance ranging from 35 hp up to 4,000 hp. It is available with different accessories such as trolling valve, electric selector valve and power take-off in hydraulic clutchable or live PTO. MGX-QuickShip is the new series of marine transmissions, starting off at around 300 hp. QuickShift is the only transmission in the market with the unique, patented clutch system, delivering cushioned torque to the driveline shock while optimising power to the driveshaft. This makes it very easy to manoeuvre the ship very preciseliy right down to very low speed. Twin Disc Power Commander Electronic Controls (EC300) is an electronic manoeuvring system allowing for total control of the ship at the touch of a finger by controlling the speed and direction of the propeller. It is possible to add up to 5 controls to the same system in order to provide the opportunity to steer the ship from different locations. 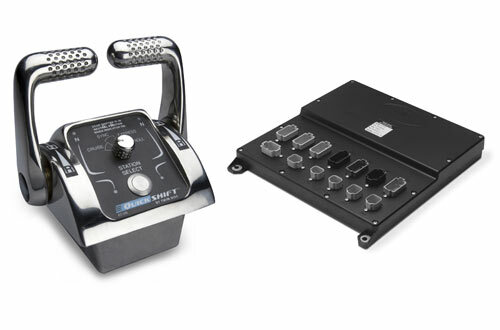 The system is easy to install and designed to interface with all popular types of electronic engines and transmissions, including of course the QuickShift transmission. Furthermore, it is very easy to install in an older ship. We stock a large selection of Twin Disc spare parts. Parts not in stock can be procured from Twin Disc’s stock.